There were allegations Maine's governor was involved in a decision to divert wood from two mills whose owners criticized him. Maine’s legislative watchdog found no evidence that Gov. Paul LePage was directly involved in a February decision to divert timber harvested on public lands away from two Maine mills. But the governor quickly overshadowed that news by demanding an apology from lawmakers, singling out a member of his own party as the “most repugnant human” he’s ever seen, then storming out of a committee hearing after being called out of order. The outburst came during a meeting Monday of the Legislature’s Government Oversight Committee. Members began by discussing a 12-page report from the Office of Program Evaluation and Government Accountability, which concluded that the timber diversion did not appear politically motivated or related to the governor’s position on softwood lumber tariffs. The two companies who lost out on the timber, Moose River Lumber and Pleasant River Lumber, both owned by the Brochu family, had been publicly critical of the governor’s position on U.S. tariffs on Canadian lumber and some felt they were being retaliated against. LePage vehemently denied those allegations – he even echoed President Trump by calling it a “witch hunt” – and encouraged an investigation by OPEGA. 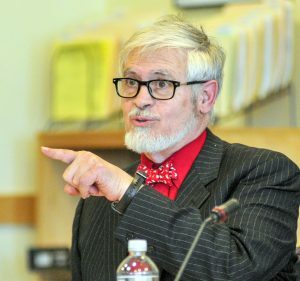 The watchdog agency found that the decision to divert the spruce and fir timber that had been harvested in Maine away from the Brochus’ mills and to Stratton Lumber was made solely by the director of the Maine Forest Service, Doug Denico. It also affirmed that the decision was made because Stratton Lumber was facing a critical shortage of logs at the time. LePage, apparently feeling vindicated, reiterated his disgust Monday that anyone would allege that he meddled. “I am a person who does not need to go behind people’s back,” he said. He then set his sights on Sen. Tom Saviello of Wilton, a fellow Republican and former forester with whom LePage has clashed in the past. Saviello was among those who raised questions about the timing of the decision during a meeting of the Legislature’s Agriculture, Conservation and Forestry Committee months ago. As LePage directed his anger at Saviello on Monday, the senator stood his ground. Gasps could be heard from other committee members and those in the audience. Sen. Roger Katz, the Republican chair of the oversight committee, tried to calm the governor by saying no one had accused him of wrongdoing. “Bull,” the governor said, before adding that Saviello is “the most repugnant human” he has ever seen. LePage replied, “Thank you,” and stormed out of the committee room. The oversight committee recessed shortly after that. When members came back, Katz entertained a motion that he and Democratic co-chair, Rep. Anne Mastraccio of Sanford, draft a letter to the governor condemning his conduct. The letter would ask that LePage apologize to members, and to Saviello individually. That motion was supported unanimously. Asked later if he thinks the governor should apologize, Saviello said, “A man apologizes when he makes a mistake,” and then relayed an instance where he was chairing a committee hearing a few years ago and criticized someone who spoke as a “(expletive) idiot.” The comment was picked up by committee microphones and Saviello said he was “out of line” and apologized to the man immediately. As for LePage’s demand that lawmakers apologize to him, Sen. Paul Davis of Sangerville, a Republican who chairs the agriculture committee, made clear that wasn’t going to happen. If anything, Davis said, it’s the governor who should apologize. The committee also voted Monday to authorize OPEGA to continue investigating the decision made in February, in large part because the report had little documentation to account for or explain the decision. OPEGA Director Beth Ashcroft explained that any discussions appeared to occur over the telephone or in person. “That made it difficult to corroborate much of what we did hear in interviews” she said. There were also at least 150 pages of documents that OPEGA received from the LePage administration that were not shared with committee members. LePage told committee members Monday that he’d turn them over but only through a Freedom of Access Act request. Saviello said he trusts the OPEGA report, but still wants the people who were interviewed to come before the committee and testify under oath. Katz and other committee members then discussed inviting those individuals to the next meeting in September for a public hearing. The government oversight committee is the only legislative body with subpoena power, something it has had to use with more frequency with LePage administration members. “I’m hopeful that anyone we ask will come before us, but we’ve been left at the altar too many times,” Katz said. Correction: This story was updated at 10:30 a.m. Tuesday Aug. 21, 2018, to reflect the fact that OPEGA received documents that were not shared with the committee.